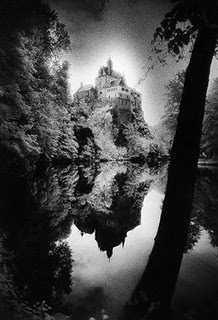 I guess you're familiar with Simon Marsden's atmospheric (if not downright spooky) infrared photographs of ruins and the like. I've recently mentioned his new book on vampires and there are two chances to get a signed copy and meet the man coming up before the New Year. The first is at the Walcot Gate, off Walcot Street, Bath, Somerset between Tuesday 29th November and Saturday 3rd December 2011 (11am - 5pm). Like the book, the exhibition is called Vampires - The Twilight World and Simon will be on hand throughout the run to answer questions and sign copies. Come and listen to internationally famous photographer, author and ghost hunter Sir Simon Marsden talk about his upbringing in haunted houses that so influenced his career. Illustrated with photographic slides he goes on to describe how he created his singular style and the techniques he uses. But most of all share some of the extraordinary adventures he has experienced when travelling in the UK and in foreign lands in search of the undead, which have sometimes been truly frightening. Here's hoping his stock of infrared film holds up.